At Energy Saving Lighting, we love high-powered LED flashlights. Their performance and battery life is just unbeatable! One of our favorite LED flashlights is the Streamlight 3C ProPolymer Lux Div 2 because it has one of the longest-reaching and brightest beams found in a flashlight. Powered by 3 “C” alkaline batteries, this tactical LED flashlight is able to provide a beam of up to 3,500 Candela at peak beam intensity. Even with that bright beam, however, the Streamlight 3C ProPolymer Lux Div 2 is able to run for up to 5.5 hours at full intensity, with another two hours of declining usable light, so you’ll have the light you need when you need it. Another great feature of this is that it’s a waterproof flashlight. Its lightweight case is sealed with an o-ring to keep your flashlight dry when you need it. Its body has been constructed of a lightweight Polymer Engineering resin that’s virtually indestructible. 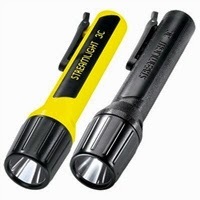 The resin also makes this flashlight shock-resistant and non-conductive. Operating this Streamlight flashlight is a dream, too. It offers a push-button switch on its tail end to make for convenient on and off functions. At 9.3” long and 15 oz., the flashlight offers the right size for many tactical operations. Additionally, with its wrist lanyard connection and spring-loaded clip, you have multiple ways to hang onto your flashlight. What feature do you want most in a flashlight? Let us know in the comments below!